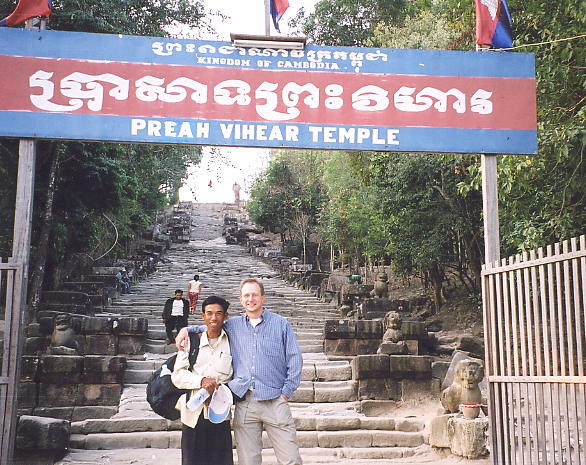 January 2005 marked my eleventh trip to Cambodia since my first-ever visit in 1994. I'm still on the hunt for previously unseen ancient temples from Cambodia's glorious Angkorean period (this time around I located around 40 structures that I'd not previously seen) whilst catching up with the many friends I've made from previous visits. Each trip is full of fun and laughter, and a host of new experiences and my latest expedition was no exception. I've now posted my travel tales, with more photographs to follow very soon. In the meantime, there's one discovery I made which may help others to enrich their visit to the vast temple complex of Banteay Chhmar, located in the northwest border region with Thailand. Famed for its unique multi-armed wall carvings and giant Bayon-style heads atop its towers, Banteay Chhmar is actually the nucleus of a series of satellite temple sites, all within 500 metres of the main complex. Four of the eight temples I found nearby still retain their own massive towers with smiling Bayon-style Avalokitesvara faces surveying the surrounding countryside. Whilst some were difficult to access due to the dense vegetation, all were remarkably close to the main site and well known to the local children. 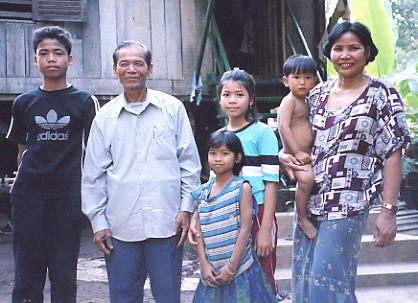 The temple of Ta Prohm for example lies behind the small market and its water-filled moat is in constant use by local families. Other moated temples like Prasat Samnang Tasok and Prasat Chegnchemtrei were considerably more difficult to gain access to and I recommend you take a machete with you to clear the vegetation. They stand at the four compass points with Banteay Chhmar at the centre and make a visit to this important Jayavarman VII-period temple all the more interesting and challenging. I included a second visit to the fantastic mountain-top temple of Preah Vihear on my travels, and also paid a return visit to the tenth century capital city of Koh Ker, previously one of the most remote and inaccessible temple sites in Cambodia, but now an easy two-hour drive from Siem Reap. A new road takes you into the heart of the temple complex and with recent demining activity, access to no less than 20 temples awaits today's visitors. This is an extraordinary site and once the landmines have been fully cleared, I'm positive a lot more temples will become accessible. Whilst this has reduced the romantic and adventurous nature of a visit to Koh Ker, it has opened up to all another important chapter in the history of this incredible country. In addition, I went hunting for temples in the Angkor Chum district, northwest of the main Angkor complex and found a twelve-arch laterite bridge, Spean Thma, and four temple sites. In the recently demined area around Ta Siem (northeast of Phnom Kulen), I located another four temples in the forest, whilst also spending a pleasant morning visiting the lakeside village and submerged forest at Kompong Phluk, on the banks of the Tonle Sap Lake. 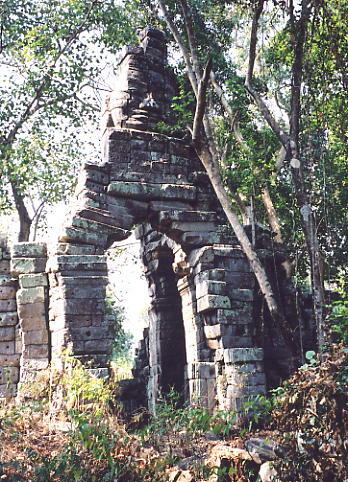 The ancient Royal Road between Beng Mealea and Preah Khan of Kompong Svay was the target of one of my forays into the Cambodian countryside. Accompanied by my pal, Rieng, we located three temple sites, Prasat Preah Theat, Prasat Pram and Prasat Ta En, as well as the mightily impressive 14-arch bridge at Spean Ta Ong, as well as smaller bridges at Spean Khmeng, Spean Toch and Spean Khvao. We also inspected at close quarters the incredible Spean Praptos at Kompong Kdei and the eight smaller Angkorean bridges on the main road between Kompong Kdei and Siem Reap, where the Cambodian government have deliberately constructed the main highway to avoid destroying these historical treasures. One hidden gem that came as a surprise were the seven lintels I came across at Wat Sleng, a few kilometers outside Kompong Thom town-centre, which my trusty pal Sokhom took me to. 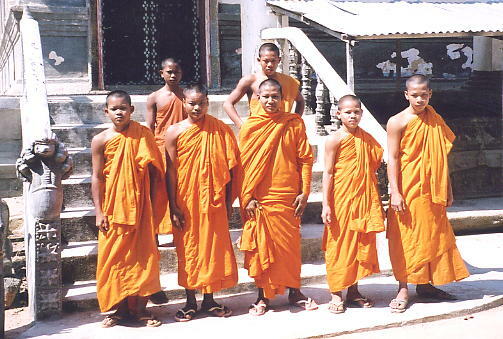 Well worth a trip to see the lintels inside the old pagoda, and to meet the friendly caretaker and young monks. I visited a few schools on my travels, as well as simple, uncomplicated trips into the countryside with no agenda other than to enjoy the scenery and to interact with the local people. 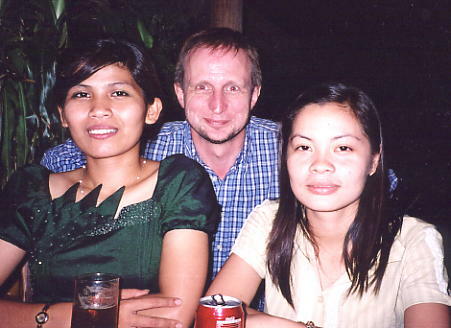 I linked up with many friends in various locations, none moreso than in Phnom Penh where I enjoyed reunions with my friends and their family members in Toul Kauk and Samnang, my favourite waitress who works amidst the excellent British fare served up at The Rising Sun pub. 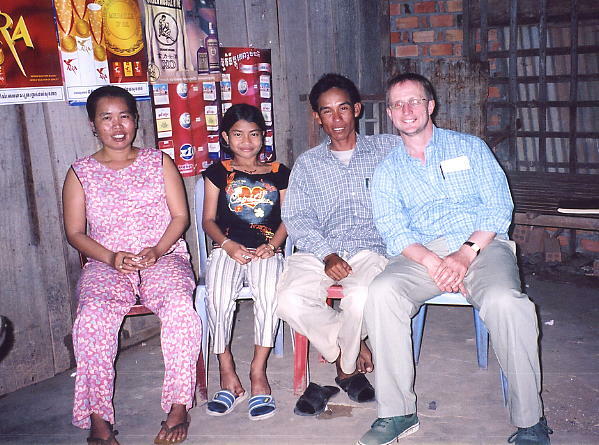 (Above): In Kien Svay, I managed to locate and hand out copies to some of the children I took photos of at a kid's party in December 2003, including twelve year old Vansy ('little frog'), who has lost none of her sparkling personality and beaming smile. She's just started learning English and I'm looking forward to testing her newly-acquired knowledge when I next return to Cambodia. Her family gave me a great reception when I turned up on their doorstep. I say it every time, but its true. The family who run the Dara Reang Sey Hotel in Phnom Penh looked after me like a king. Their warmth and hospitality is simply second to none and I thank them sincerely for their kindness on each of my trips. I recommend them without a moment's hesitation. My base in Siem Reap this time around was the HanumanAlaya Guesthouse, tucked away in a quiet area near the Angkor Conservation compound. Great rooms, nice people and a very relaxing ambience. Check out their website for more information. 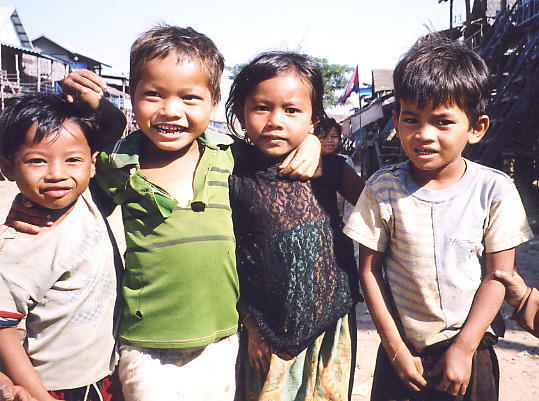 Here's a few photos [click to enlarge; position your mouse pointer over each photo to read the caption] and below them, links to the rest of my Cambodia Tales.